The book’s jacket says that the story deals with Frederic Henry’s “passion for a beautiful English nurse” and deals with “the profound struggle between loyalty and desertion. Now maybe I wasn’t reading into the text deeply enough, but I didn’t experience either of these aspects of the novel. Frederic does have a relationship with Catherine, an English nurse, but I never felt any passion in the relationship. Aside from a few passages, Frederic seems almost ambivalent about it all. His passion for Catherine did not come across to me, although the novel is entirely in first person from his perspective. As well as this, there are incidences of loyalty and desertion in the novel, but I didn’t sense the struggle between them, at least not from Frederic. He seemed to simply walk away – well, jump into a river and be swept away, but the point is that I felt no regret from him, no anguish and no struggle. As much as I enjoyed the novel in general, and Hemingway’s writing style, I seem to have read it completely differently to how I should. I don’t mean I read it while standing on my head, but that my understanding of the characters was different. Frederic to me seemed rather like a drifter, coasting through life and just taking whatever comes – for example, he and Catherine got along, so he ended up with her. I found Catherine incredibly annoying and clingy; very early in the relationship, possibly their second meeting, she pressures him to say he loves her – later she claims this was a silly joke, but I really felt it set the tone for her character, constantly needing reassurance, having no will of her own and simply wanting to be an extension of Frederic. I did however enjoy the writing. Sometimes it seemed simplistic, too simplistic, but Hemingway’s style did help to paint a vivid picture of the war in Italy. There were moments of light humour, usually involving Frederic’s friends in the army, and some came across as being almost unintentional, but I expect Hemingway crafted every sentence of this novel with the utmost care, and nothing is unintentional. This assumption is backed up by the edition of the novel which I read, a new special edition which includes some early drafts of certain passages and all 47 alternative endings. Many of these alternative endings are very slightly different versions of the same thing, and the majority of them are not dramatically different to the actual ending – these alternative endings seem largely to be Hemingway trying to get how he expressed the ending right, rather than trying out different events to conclude the novel. It was interesting to glance through these endings, but all these additions would be of much more interest to devotees of Hemingway who have studied his work. 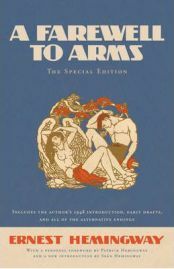 Despite being unimpressed with the characters, I did enjoy A Farewell to Arms, and I will certainly read more of Hemingway’s work. Whether this was the best novel to start with I don’t know, but I would recommend it – and the special edition would make an ideal Christmas gift for Hemingway fans. Many thanks to Heinemann for providing a review copy of the new edition of A Farewell to Arms. No Comments on "A Farewell to Arms"